New England Patriots 2011: Is it time to lose faith in Tom Brady and Bill Belichick? Is it time to lose faith in the New England Patriots? 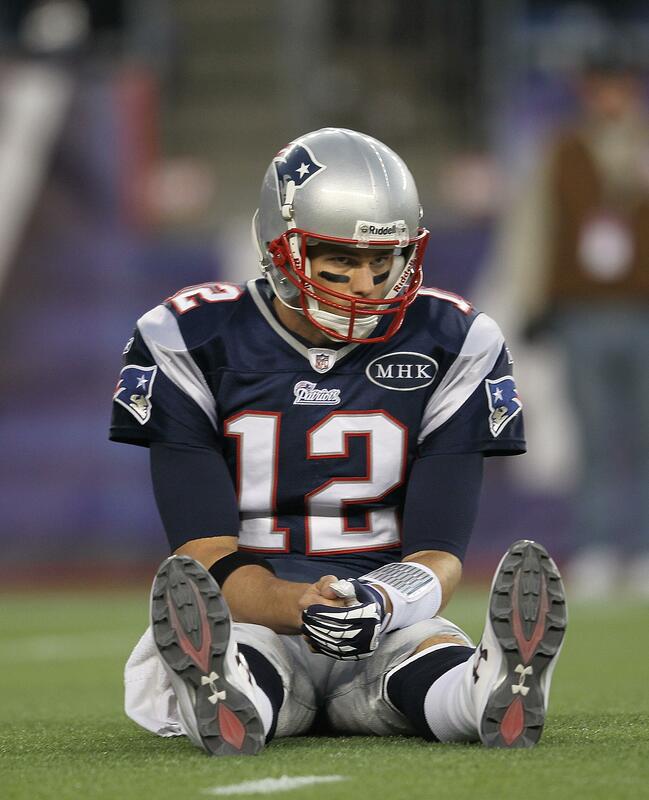 Patriots quarterback Tom Brady after getting knocked down against the New York Giants. A football team’s reputation does have a powerful inertia to it. I recently learned, to my joy, that some of my younger coworkers don’t even remember Notre Dame as a real football power. To them, the Fighting Irish have never been anything but an oddity: always overmatched, yet always overexposed, for reasons lost to history. The same goes for the Dallas Cowboys, who haven’t won a Super Bowl since Sarah Jessica Parker was 30 years old. Tony Romo is essentially the secular version of Tim Tebow—people loathe him because his aura has so little to do with his accomplishments. Or there’s Mark Sanchez, who shows up on magazine covers today because Joe Namath played one good game 42 years ago. It’s worse in college, because NCAA football championships are awarded based on how good people think you are. True, a glaringly bad season from the likes of Notre Dame or Florida State will eventually drop them in the polls. But it’s harder for teams and conferences without elite reputations to make the jump in the other direction. Boise State was No. 5 in the preseason AP poll; three of the four teams ranked above it are no longer undefeated, but Boise State is still No. 5. In the NFL, the main victims of irrational faith in the wrong teams are the TV viewers, who end up watching featured games that seemed like good ideas in the offseason, when a Monday night game between the Bucs and Colts sounded like a potential Super Bowl preview. The scheduling isn’t perfectly balanced, and it’s not impossible for a shaky team to exploit a soft division and a favorable postseason draw. But nobody gets blackballed just because they weren’t expected to be good. The AFC has a bit of a different look to it, as you start to size up who the teams to beat are. Obviously, the Patriots will always be in that conversation as long as [Bill] Belichick and [Tom] Brady are alive and well and coaching and playing for the New England Patriots, but it’s going to be interesting to see who comes out of the AFC this year. Belief, meet results. The Patriots did lose there at home that day to the Giants. Brady threw a touchdown pass to put New England ahead with 1:36 to go. And Eli Manning led New York back down the field, hitting his tight end with a third-and-goal play-action pass with 15 seconds left. Maybe Eli Manning is good? The younger Manning is a No. 1 draft pick with a famous pedigree and a Super Bowl ring, playing in the most self-regarding media market, but enthusiasm for him has been slow to build. It still feels safer to believe that the Patriots machine will come through, even as New England loses two in a row and the canny, counterintuitive personnel genius Belichick is forced to go harpoon-and-release with Albert Haynesworth. Still, as Manning took the field for that winning drive, the TV crew, to its credit, invoked some unromantic truth about the Patriots: The Giants would be attacking the league’s worst-ranked pass defense. And both of New York’s fourth-quarter touchdown drives included interference penalties on New England. So maybe it’s best to believe in some other team entirely. How about last year’s Super Bowl winners, still undefeated this season? Why do we keep looking for champions from the past, or trying to find speculative future ones? Isn’t what we have in Green Bay enough?